Ali and the American civil rights icon Angela Davis were the speakers at the free public event, “Solidarité et Alliances”, to commemorate 50 years since the massive May 1968 civil unrest, which paralysed the French economy through nation-wide strikes and demonstrations. As they spoke at a packed theatre, students were blocking buildings at nearby Paris Nanterre University, hence Ali’s comments. Similar action has been taking place at universities in Paris and other cities such as Toulouse and Rennes. Echoing 1968, France is currently gripped by a series of strikes involving railway employees and other workers, while students are demonstrating against the government’s higher-education reforms that would make admittance to public universities more selective. The students say the changes are contrary to the French tradition of offering all high school graduates a place at public universities and would adversely affect poorer students, who are already underrepresented on campuses. The government’s stance is that reform is necessary to deal with a high drop-out rate and overcrowded institutions. Rail workers, meanwhile, object to the restructuring of the national railway company, the SNCF. On Labour Day, May 1, street marches in Paris erupted in violence, with masked far-Left “anarchist” agitators burning vehicles and smashing shop windows. The widespread protests coincide with several conferences and cultural programmes that are reflecting on themes of revolution in remembrance of “May ‘68”. Davis, for instance, will be back in France next month as the keynote speaker at a conference at Paris Nanterre University titled “Revolution(s)”. The organizers – La Société des Anglicistes de l’Enseignement Supérieur (SAES) – are hoping the campus will by then be accessible to the 400 expected participants. “Nanterre as a town doesn’t have much of a historical aspect; it’s not like Paris or Bordeaux. The one thing we have here is the university and the ’68 protests,” said Bernard Cros, the main organizer of the meeting and a lecturer in British and Commonwealth studies. The 1968 student demonstrations actually started at Nanterre, when students occupied an administrative building to protest class discrimination and other societal issues. Subsequent confrontations with the university administration and law enforcement agents led to additional universities and the public joining the protests, and, at the height of the May ’68 movement, more than 10 million workers were on strike in France. Fifty years later, the current protests at Nanterre began when a group of students occupied a classroom in April to voice disapproval of the government’s reforms. The situation escalated when the university’s president called in the police to remove them, and officers in riot gear descended on the university. That in turn caused others to join the protest in solidarity. Since then, students have shut down the campus. Visitors can see iron barricades in front of doorways, along with graffiti such as “Make Nanterre great again”, a paraphrasing of the slogan used by Donald Trump during his presidential campaign, and that used by French President Emmanuel Macron to show his support for climate action (“Make our planet great again”). The conference with Davis may not make the university “great again” but her presence in France generates huge interest among students, faculty and the public. Cros said that Davis’s name was the “first that came to mind” when Nanterre was chosen as the 2018 site of the annual congress of the SAES – an academic association for those researching and teaching English language, literatures and culture. The university awarded Davis an honorary doctorate in 2014, so she is “already linked” to the institution, he added. Indeed some 900 people filled the Nanterre-Amandiers Theatre at the May 3 event where Davis and Ali spoke (the event is separate from the coming university conference). As the activists walked onto the stage, there was deafening applause and several young people leapt to their feet with shouts of appreciation. “I’m not a person who tends to be inspired by nostalgia, but sometimes I find myself wanting that closeness (from 1968) again,” said Davis, in response to a question from one of the evening’s moderators about whether the “historical memory of ‘68” could help the world to imagine a better future. Davis was a member of the Black Panther Party in the 1960s, and active in the civil rights movement before and after the assassination of the Rev. Martin Luther King in April 1968. Later, in 1970, guns she had bought were used by a high-school student when he took over a courtroom to demand the freeing of black prisoners including his brother, and left the building with hostages, including the judge. In a subsequent shootout with police, the perpetrator, two defendants he had freed and the judge were killed, and Davis was arrested following a huge manhunt, and charged with “aggravated kidnapping and first degree murder” of the judge, although she had not been in the courtroom. She declared her innocence, and sympathisers in the United States and other countries, including France, mobilised to demand her freedom. After being incarcerated for 16 months, she was released on bail and eventually acquitted of the charges in 1972. 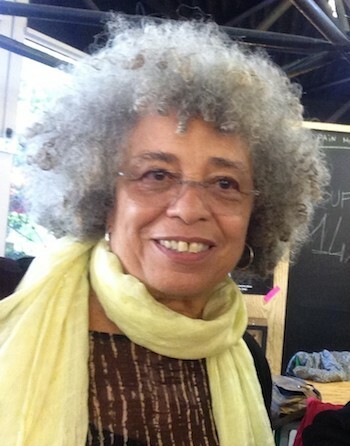 During the theatre discussion, Davis described the civil rights struggles in which she had participated, highlighting the gender battles in particular, and pointing out that the U.S. civil rights movement was “very much informed” by what was happening around the world at the time. For Tariq Ali, the ’68 movement was a time of international solidarity. In contrast, “there is very little solidarity with the Arab countries” at present, he said. He said that citizens should demand of countries that if they start a war they should “take 100,000” refugees. Many in the audience reacted with applause to these words. (In another university near Paris -at Saint Denis – migrants have occupied a building for several months, largely with the support of students who’re also demonstrating). Outside the theatre, the “revolutionary” fervor is continuing. 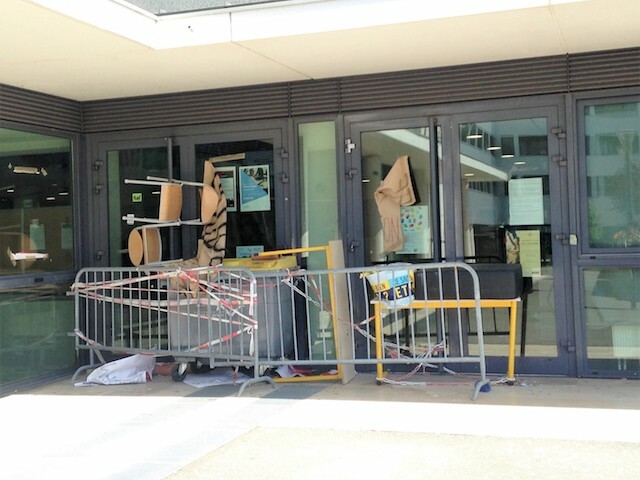 General strikes are expected to last throughout May and June, and the Nanterre students have voted to continue the protests until May 7 for now. With more than 2 million students in higher education, France ranks 19th among 26 developed countries for the quality of the sector, according to statistics from the Paris-based Organisation for Economic Cooperation and Development, and other observers note that funding for public universities is decreasing. (The government has promised increased financing). Meanwhile, some students just want to get on with their lives. One third-year student said that while he understood the motivations of his protesting peers, his concern was to take his exams and finish his programme.